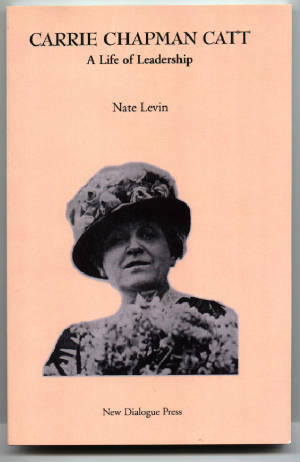 Following is the full text of my young person's biography of Carrie Chapman Catt. Scroll to bottom of page for related links. The movement to win voting rights for women began in 1848 with the Seneca Falls convention organized by Elizabeth Cady Stanton, Lucretia Mott and others. For the next fifty years, Mrs. Stanton, Susan B. Anthony, Lucy Stone and other extraordinary reformers, both women and men, fought a difficult and often lonely struggle—lecturing, writing, traveling, organizing meetings, bringing lawsuits—doing whatever they could to help their cause. But the fight to extend equal voting rights for women, known as “the woman suffrage movement,” suffered from disorganization and internal disagreement. All their talent, commitment and hard work had made women’s rights a popular subject for debate. Many people supported voting rights for women, but others were still unconvinced, or were actively opposed to woman suffrage. The opponents included most men, many wealthy corporations and almost all politicians. By the mid-1890s only two lightly settled western states had granted women equal voting rights. Only a tiny percentage of women were allowed to participate in government. The mid-1890s marked a turning point for the cause of woman suffrage. Over the next 25 years the movement was rebuilt from the ground up until it became an overwhelming political force, with more than 2 million members, and effective branches working together in every state and every important city and town, in most neighborhoods and farm communities. By 1920, the battle was won. Every adult citizen, woman as well as man, enjoyed an equal right to vote. This is the story of one great leader who changed woman suffrage from a reformer’s dream and hope into a political reality: Carrie Chapman Catt. Carrie Lane was born in 1859 near Ripon, Wisconsin. Like many children of her times, Carrie grew up on a farm. Her family was better off than many farming people. Her father had made some money in the California gold rush that helped him get started as a farmer. Her mother had attended a well-known school for women in Worcester, Massachusetts and received a much better education than most women of those days. Carrie was a bright and confident child, always looking for something to do, some way to help out her mother. Her mother helped her learn to read, and before long, she read every book in the house. When she was five years old Carrie started attending a one-room school near her home. Her independence and curiosity led her to learn quickly and well. Carrie could take care of herself on the playground and knew how to deal with bullies. When her older brother Charles or other boys teased her or other girls in her class, she wasn’t afraid to fight back. When Carrie was seven her family moved to a farm near Charles City, Iowa. Carrie’s father planned the move carefully so that the new farm would be a success and Carrie’s mother could have some of the comforts of living near town. Even though the farm was close to town, it was still in the country. There were no other children of Carrie’s age nearby, but Carrie enjoyed spending time by herself. She would take a book outside to a favorite place and read for a while, then walk around talking to herself about what she had read. Sometimes she read poetry and repeated it aloud until she had learned it by heart. Carrie attended a one-room school near her home and then went on to high school in town, a five mile ride on horseback. Carrie continued to be a good student, finishing high school in three years. Carrie’s family was interested in politics and supported reform candidates like Horace Greeley, who ran for president in 1872. At that time Carrie first became aware that women did not vote. She couldn’t understand why her mother did not go into town to vote for Greeley. The explanations about why women weren’t allowed to vote made no sense to her. From this time on, anyone who tried to tell Carrie that women should not have the right to vote was certain to get an argument. Around this time Carrie became interested in medicine and decided she wanted to be a doctor. She collected reptiles and insects that she found on the farm, and learned about the theory of evolution from Darwin’s Origin of Species. Darwin’s writings sent Carrie’s curiosity in new directions, and she started asking questions about religious beliefs. The answers didn’t make much more sense to her than the reasons why women couldn’t vote. Carrie was independent-minded. She did not accept ideas unless she had carefully thought them through and decided they made sense. And when she made plans, she found a way to carry them out. Carrie was determined to go on to college after high school. The cost was about $150 per year to attend the state college at Ames, Iowa, and Carrie couldn’t depend on much help from her father. Although he owned plenty of land, he was short of cash and wasn’t interested in spending money on his daughter’s education. Eventually he offered her $25 per year and told her she would need to earn the rest somehow. Carrie was perfectly prepared to do this. She had already obtained a certificate as a schoolteacher and planned to teach school during summers and winters and go to college in the spring and fall. She would also find part time jobs during the college terms. Money would be tight, but she could make do. In March 1877, when Carrie entered the Iowa State Agricultural College (which later became Iowa State University) it was a small college and less than ten years old. Twenty-six other students entered in the same class with Carrie, including five other women. Three and a half years later, Carrie was the only woman among a graduating class of eighteen. While in school, Carrie worked hard, studied hard and received good grades. She taught school in the winters for $25 per month, washed dishes and worked in the library during the college term for nine or ten cents an hour. She never had any spare time. Soon she started to become what we now might call a “work-aholic”. She always felt she should be accomplishing something. She gave up reading poetry. She wasn’t interested in works of fiction. She only read books that were important for her education. Carrie became a leader among the students. She was active in the college literary society. Until Carrie joined, women had not been permitted to make speeches at the society. But Carrie made a speech, and from then on women became equal participants. Carrie went on to become an officer of the literary society, and organized a debate about whether women should be allowed to vote. Carrie spoke frequently and became recognized as a good speaker. Carrie also noticed that women were not included in the military training that was a regular part of the college activities for the men students. So Carrie started a military drill company for the women students. The women’s company—Company “G” for girls—continued to exist for many years until a physical education program was established. All of the professors at the college believed strongly in the theory of evolution and Carrie was taught about evolution in many of the courses that she took. By the time she graduated, Carrie was convinced that the human race was improving and would always continue to do so. It became her life’s work to help hurry along the inevitable improvement. Carrie never lost her belief that evolution and progress were the destiny of mankind. After graduation, Carrie planned to become a lawyer and started to study law in a lawyer’s office. Then she was offered a job as a high school teacher in Mason City, Iowa. She took the job to save money for law school, but she did so well as a teacher that she soon was appointed principal of the high school and superintendent of schools. There were some people who though Carrie was not the right person to be school superintendent. Many children had been skipping classes and causing trouble. Would a young woman like Carrie be able to handle disciplinary problems? One of the first things Carrie did as superintendent was to visit every school in town. She found the worst troublemakers and gave each one a sound thrashing. Discipline suddenly improved. While living in Mason City, Carrie met Leo Chapman, who had moved there to become the owner and editor of one of the two main newspapers in town. Carrie and Leo were two of the brightest and most capable young people in Mason City. They were both interested in politics and reform and started working together. They soon became close friends and were married in February 1885. As was expected of women in those days, Carrie resigned from her job as school superintendent after her marriage. But in a very unusual arrangement, Carrie then became her husband’s partner as editor of the newspaper. Carrie frequently wrote articles about women’s rights, including voting rights. She became active in the Iowa organization that was working for woman suffrage. She talked with every woman in town about signing a petition asking for the right to vote in city elections. All but twelve women signed the petition. The state organization was so impressed that they invited Carrie to attend their state convention in Cedar Rapids in October 1885. At the convention, Carrie heard a speech by the famous suffrage leader Lucy Stone. Later, Carrie met Miss Stone and asked her many questions about the movement for women’s voting rights. Soon after Leo and Carrie were married, they became involved in a political fight against an elected school official named Shepard. Leo arranged for Carrie to be a candidate for County Superintendent of Schools, but Carrie lost the election. Then Leo worked against Shepard’s reelection as School Auditor. Leo printed a newspaper article that accused Shepard of trying to steal money from the schools. But Shepard was reelected and accused Leo of libel. Shepard was so powerful that Leo and Carrie had to sell their paper quickly and Leo had to leave town. He went to California, but before Carrie could join him there, he caught typhoid fever and died. Suddenly Carrie had lost her husband, her job, her home and her money. She moved to San Francisco and lived with her aunt Myra Miller, who had helped Carrie arrange for Leo’s funeral. Carrie did odd jobs for newspapers, sold advertisements and wrote freelance articles. Some of the men Carrie worked with treated her badly. Carrie was deeply upset. It was the worst time in her life. To earn extra money, Carrie started giving public lectures. Her experience in the college literary society had helped her become an effective speaker and her lectures were successful. One popular topic was about the problems caused by recent immigrants to the United States. Carrie also became acquainted with George Catt during the time when she lived in San Francisco. George was a construction engineer who specialized in building bridges. He had gone to the same college as Carrie, but he had started after she had. When George was a first year student, Carrie was already one of the best-known students and George admired her very much. He was glad that he now had the chance to become her friend. In August 1887, Carrie moved back to Charles City, Iowa. Her younger brother William lived with her so that he could go to high school without riding into town from the farm every day. Carrie continued to earn a living by lecturing and taking temporary jobs as a newspaper editor. She also continued reform work. She joined the Women’s Christian Temperance Union, which campaigned to outlaw alcohol and also worked for woman suffrage. Soon Carrie became involved again with the Iowa state woman suffrage organization. She attended the state suffrage convention in October 1889 and became a paid organizer, traveling all over Iowa to give lectures on suffrage and to set up local clubs of suffrage workers. Carrie became known as one of the best suffrage organizers in the country. In 1890 she gave a series of lectures along the east coast and she attended the national suffrage convention in Washington, D.C., where she made a speech. The 1890 convention was the most important meeting for the woman suffrage movement in many years, because it marked the settlement of a dispute that had divided the movement. For twenty years after the Civil War, the movement was split between two groups. The National Woman Suffrage Association, led by Elizabeth Cady Stanton and Susan B. Anthony, was made up of suffrage supporters who had been against granting voting rights to freed slaves and other black men unless all women also were allowed to vote. But Lucy Stone, who had also worked to abolish slavery, believed it would not help the cause of woman suffrage to stand in the way of citizenship for African American men. Lucy organized the American Woman Suffrage Association with the help of her husband Henry Blackwell. The division between the two major suffrage organizations was kept alive by personal bad feelings between the leaders of the organizations. There were also disagreements about what was the best way to try to achieve the goal they shared. The “American” thought the best approach for winning suffrage was to fight state-by-state to change the state constitutions, but by 1890 only one state had granted voting rights to women. On the other hand, the “National” preferred to work for an amendment to the United States Constitution so that all of the women in the United States would immediately get the right to vote. Every year for twenty years, Miss Anthony and the other leaders of the “National” had asked Congress to pass the amendment, but Congress had never done anything about it. After so many years of failure, the leaders of the two organizations decided to work together by forming the National American Woman Suffrage Associations (NAWSA) in 1890. Miss Anthony became the most important leader of the combined organization, even though she was seventy years old. All of the most prominent members of the movement attended the convention, making it a very special occasion for Carrie and the other younger suffragists. It also helped to remind Carrie how important it was to have unity in the organization. When she later became the national leader herself, she constantly worked to avoid disagreements with other people who worked for suffrage. Later the same year, Carrie went to the northwestern part of the U.S. to give a series of speeches for suffrage. She also had personal reasons for making this trip. She surprised her friends by stopping in Seattle, Washington to marry George Catt. George now lived in Seattle and was a very successful engineer. Carrie planned to live in Seattle, and many of her friends thought she would stop her suffrage work. They were wrong. George Catt believed strongly in the cause of woman suffrage. His bridge-building business took up all of his time, so he could not work for suffrage himself, but he was making plenty of money, and he could afford to help Carrie continue her work. Carrie would be able to travel around the country several months each year campaigning for suffrage, and would spend the rest of the time with George. A few months after her marriage to George, Carrie Catt went to South Dakota to work in a campaign to win voting rights for women by changing the state constitution. In November, the voters of South Dakota would vote on whether to approve this change. For three months before the election, Carrie traveled through a large part of the state, riding many miles in wagons on dusty roads in the hot sun, spending the night with farm families, eating the same poor meals they did, and sometimes sharing a bed with the lady of the house. As the weather in South Dakota turned cold before the election, Carrie found she needed something warmer to wear than her summer dresses. She bought some red and yellow striped flannel cloth and made a dress out of it. The dress was hardly fashionable, but it was the best Carrie could do at the time, and at least she was warm. Everywhere she went Carrie gave strong speeches arguing for the right of women to vote. But Carrie could see that the South Dakota campaign was certain to fail. All of the major political parties and religious groups were against woman suffrage. The makers and sellers of liquor were spending huge amounts of money to fight against the suffragists. When the election came, only one-third of the voters were in favor of woman suffrage. Immediately after this defeat, Carrie went on to Kansas and Iowa to continue the work in those states. From her experience in these difficult campaigns, she learned the necessary ingredients for a successful suffrage campaign—support from the political parties and important citizens’ organizations, organized and energetic campaign workers, and a reasonable amount of money to spend on the campaign. By the end of 1890, Carrie was worn out from all her travel and work. She became very ill and had to spend the first half of the next year in Seattle, regaining her strength. In the fall of 1891, Carrie went back to Iowa to continue her suffrage work. She emphasized how important it was to constantly educate people about women’s voting rights in order to build the support that would be needed for future campaigns to succeed. The next year, Carrie attended the NAWSA convention in Washington, D.C. For the first time she went along with the suffrage leaders as they made their annual visit to Congress to ask for consideration of a constitutional amendment that would grant women the right to vote. What impressed Carrie the most was how completely bored and uninterested the congressmen were. They didn’t hide the fact that they had no intention of supporting the suffrage amendment. Carrie knew they acted this way because NAWSA had little power and the congressmen did not respect or fear people who could not hurt them. It was time for the suffrage movement to change its approach and Carrie had some ideas about how to get started. Susan Anthony was impressed with Carrie’s energy and her ability to deal with many details that are important in running an organization. She put Carrie in charge of a committee that recruited and educated new members by sending out speakers around the country. This was Carrie’s first important position in the national organization. In 1893, the woman suffrage organization in the state of Colorado arranged for an election to decide if voting right would be granted to women in that state. The Colorado suffragists asked for help from the National, but Miss Anthony though they had no chance of winning. As usual, the National was short of money. Miss Anthony thought it would be a waste to spend either time or money in Colorado. But Carrie was not so sure. She started writing letters to the Colorado women with suggestions on how to organize their campaign. As she learned more about the situation in Colorado, she began to think they might succeed. Many of the newspapers in the state supported the suffrage campaign and the political parties weren’t actively working against it. But the campaign needed money and good speakers. Carrie got Lucy Stone and her husband Henry Blackwell to contribute some money and then Carrie herself went out to campaign in Colorado. Carrie traveled around the state giving speeches and organizing suffrage clubs. The mountains and frontier conditions made it a hard job, but Carrie was young, strong and determined. Wherever she went, the cause of suffrage usually got a big boost. When the election was held in November, the national organization was thrilled and surprised to find out that the Colorado suffrage campaign had succeeded. The male voters of Colorado had agreed to change the state constitution to give women the right to vote. Colorado had become only the second state to grant voting rights to women. And this was the first time women had fought and won with their own campaign. Much of the credit rightfully went to Carrie Catt. Unfortunately, the next year brought defeats, not more victories. In New York, a few powerful conservative politicians made sure that the new state constitution would not give voting rights to women. The national organization then concentrated on Kansas where there was to be an election on suffrage. All the national leaders went to Kansas to campaign. Carrie spoke at least once in almost every county in the state. But two of the three main political parties fought against suffrage. The economy was very bad and the people were divided and upset. Carrie had had very good audiences for her speeches and expected the campaign to succeed. Instead, the result of the election was a crushing defeat. After a few weeks at home to rest and recover, Carrie joined Miss Anthony in a tour of five southern states. The cause of suffrage had always been especially weak in the South, but now things were beginning to change there. Miss Anthony was so famous that many people came to hear her speak. Sometimes when she wasn’t feeling well, Carrie filled in for her. Everywhere they went, important people invited them into their homes. And everywhere, Carrie made sure to organize local suffrage clubs. The tour was a success. In February 1895, the National American Woman Suffrage Association held its convention in Atlanta, Georgia. This was the first time the National had met outside of Washington, and the meeting received a lot of publicity. Miss Anthony asked Carrie to head the committee which would plan the Association’s work for the next year. The committee presented a report which said that 40 years of activity had not resulted in an effective organization. It was necessary to have national and state associations working together in a coordinated way. There had to be specific goals and enough money must be raised to meet those goals. The convention agreed that changes were necessary. A permanent Committee for Organization was formed with Carrie in charge. For the next five years, Carrie headed the Organization Committee, which was responsible for all of the field work of the National Association. Her friend Mary Garrett Hay worked closely with her during this time. With Carrie leading its Organization Committee, the National Association became much more active. In 1895, ten states had no state suffrage organization. Carrie saw to it that organizations were soon started in those states. Carrie also emphasized that organizations had to be set up everywhere on the local level. Teams of organizers were sent out to travel in various parts of the country to educate the public, recruit new members and organize local suffrage clubs. Usually a speaker and a business manager traveled together. The speaker made the speeches, met and spoke with the important people in the area and brought public attention for the cause, while the business manager made the traveling arrangements, kept track of contributions and expenses, organized meetings and publicity, recruited members, and taught local supporters how to organize and run a suffrage club. Carrie’s Organization Committee kept busy constantly encouraging and directing activities all over the country. Of course this was before the time of telephone, radio, television and travel by airplane. To communicate with people, it was necessary to write letters, publish a newspaper, or travel around by train and wagon giving speeches. Carrie’s group sent out dozens of speakers and thousands of letters. Their letter writing alone used up ink by the quart. By 1897, NAWSA had raised five times as much money as in 1892. Although there were defeats in state campaigns in California, Iowa, South Dakota, Oklahoma and Arizona, there were also victories. When Utah became a state in 1896, the state constitution granted full voting rights to women. The same year, all four political parties in Idaho supported woman suffrage and the voters approved it. In 1898 the state of Louisiana granted voting rights to women who paid taxes. This was an important step forward in a southern state. Carrie started making speeches to the members of NAWSA, praising the workers who actually helped move the cause forward and criticizing members who did nothing. This was probably something that had to be said but a lot of the members were not happy to hear it. Early in 1899, Carrie learned that her father had become very ill. She went back to Iowa to visit her parents. Soon after she arrived, her father asked her why she spent all of her time and effort campaigning for woman suffrage. He knew she was not being paid for her work. Was she trying to gain friends, to become famous? Carrie said she did not think so. Then why did she do it? Carrie had no answer. She didn’t know what drove her to fight so hard for women’s rights. Then her father started talking about when he was young, his ambitions and how he had tried to achieve them, mainly without success. He seemed to understand how a person could be driven without knowing why. Carrie stayed with her parents and helped to care for her father. A few weeks later, he died. Although she was very tired and sad, Carrie soon left to resume her suffrage work. At the NAWSA convention in April 1899, Miss Anthony, who was then almost 80 years old, announced that she would be resigning as president of the Association at the next annual convention. The members would have to choose a new president. Many thought it would be Dr. Anna Howard Shaw, who was one of the best-known leaders. She was famous for her ability as a speaker and was a close friend of Miss Anthony. Later the same year, Carrie and her friend Mary Garrett Hay made a long tour of the West and Midwest. They covered 13 states. Carrie gave many speeches and appeared at several state suffrage conventions. At the NAWSA convention in 1900, Miss Anthony said that Carrie should be the next president of the Association. The movement needed Carrie’s energy, organizational skills and ability to get things done. The members agreed and elected Carrie as president of the Association. This only made official the fact that Carrie had already been the most important suffrage worker over the last five years. Almost immediately Carrie suffered a bitter disappointment. She asked that the Organization Committee continue with her friend Mary Garrett Hay in charge. Instead, the convention voted to abolish the committee. Some people said that Mary Hay was hard to get along with. It is also possible that many of the older members did not want Carrie, who was then only 41 years old, to have too much power. Carrie was very upset. She felt that the Association did not really want her to be its president. She also believed that the Organization Committee had been doing the best work for suffrage and was needed for the cause to make progress. She thought about resigning as president but she knew that would hurt the Association. She decided to remain as president and to do the best she could. Carrie continued to be the president of NAWSA for four years. She traveled around the country making speeches and encouraging the state and local suffrage organizations. But this was not a successful period for the suffrage movement in the United States. There were defeats in Oregon and New Hampshire, and there were no victories. The Association was not ready to work the way it needed to in order to be successful. Carrie was often busy with her family. Her husband and mother were both in poor health. Carrie herself was also ill during some of this time. In spite of these problems, Carrie did accomplish one important thing during her first term as president of NAWSA, and this was the founding of the International Woman Suffrage Alliance (IWSA). Carrie had recognized that the movement for women’s rights, including the right to vote, was important not only for women in the United States but for women everywhere. She knew that Britain, Australia, Norway and Holland had woman suffrage organizations, but these organizations did not work together, and no one knew what was going on in other countries. Carrie worked to change that. She started writing letters to women’s organizations in other countries to find out what they were doing to win voting rights. At Carrie’s invitation, suffragists from Britain, Germany, Norway, Sweden, Denmark, Turkey, Russia, Australia and Chile came to the NAWSA convention in 1902. All of these representatives visited President Theodore Roosevelt at the White House to describe how they were working for suffrage in their own countries. Carrie also published a paper, which described what legal rights women had or did not have in 33 countries. In 1904, the International Woman Suffrage Alliance held a convention in Germany. Carrie was the President of the Alliance and was Chairwoman at the meetings. The IWSA was then made up of the national suffrage organizations of eight countries: Australia, Denmark, Germany, Great Britain, the Netherlands, Norway, Sweden, and the United States. There were also representatives from organizations in Austria, Finland and Hungary, which would soon become members. The speeches and other activities at the convention were covered by a considerable number of newspaper reporters from around the world and the cause of woman suffrage received much favorable publicity. That same year, Carrie announced that she would resign as president of NAWSA. She needed to spend more time taking care of her mother and her husband. Carrie was also worn down and needed rest. She would continue working for suffrage, especially as president of IWSA, but she could not work as hard as she had before. By the time Carrie stepped down as president, NAWSA was stronger and had more money than ever before. Dr. Anna Howard Shaw was elected as the next president of NAWSA. In October 1905, George Catt died. He was only 45 years old. He had worked very hard for many years as the owner of one of the best engineering companies in the United States. The money he made allowed Carrie to travel and spend time and money working for suffrage. Her accomplishments probably would not have been possible without his support. Carrie was terribly sad and ill after George’s death. Her dear friend and co-worker Mary Garrett Hay came to live with Carrie. The two women would continue to be close friends for many years. In spite of illness and personal losses, Carrie continued her work as president of the International Woman Suffrage Alliance. In 1906, Carrie organized an IWSA convention in Denmark. At that time the Alliance was joined by four new branches, from Canada, Hungary, Italy and Russia. Soon after the convention, Danish women were granted the right to vote in city elections. Carrie continued her visit to Europe by traveling through parts of what was then the Austrian Empire and is now Austria, Slovakia and the Czech Republic. She made speeches about woman suffrage in the major cities and helped get people interested in the suffrage cause. Dr Aletta Jacobs, a leading Dutch suffragist, was Carrie’s companion during this tour. One of the problems Carrie faced during the Czech and Slovak portions of her trip were the divisions among her audience. The Czech and Slovak women were not on speaking terms with the women in those areas who spoke German. As a result Carrie had to hold two meetings in some towns, one for Czech or Slovak women and one for women of German background. The next IWSA convention was held in Amsterdam in 1908. The Alliance continued to gain new branches, as national suffrage organizations from Bulgaria, South Africa, Finland and Switzerland became members. This was a time of great excitement for the international suffrage movement. Norway had granted full voting rights to women and sent an official delegation to the IWSA convention. In England, the suffragists were holding very large and sometimes-violent protest marches. All around the world people were paying close attention to the English suffrage movement and thinking about what their own country’s position should be on “the suffrage question”. Some American women were working with the English suffragists and participating in their protests. They thought that American suffragists should also be making public demonstrations and that NAWSA was too conservative in its tactics. This was the beginning of a split in the U.S. suffrage movement between the traditional movement represented by NAWSA and more radical groups. But would this division cripple the movement like the old split between the National and American Associations? In the long run it cannot matter where the victory comes earliest, since our cause is not national but international. … We must grow closer to each other; we must learn to help each other, to give courage to the fainthearted and cheer to the disappointed of all lands. Within our Alliance we must develop a spirit of internationalism, a spirit so clarified from all personalities and ambitions and even national antagonisms that its purity and grandeur will furnish new inspiration to all workers in our cause. The cause of equal suffrage and social emancipation was something that all women could share. As the IWSA continued to grow stronger, Carrie began spending more time on suffrage activities in the United States, and particularly in New York, where Carrie had lived for many years. She put together an organization made up of all the suffrage clubs in and around New York City. Soon after, with the help of Mary Hay, she founded the Woman Suffrage Party of New York, which was organized like the Democratic Party, with representatives from each assembly district. Organizers in many other states and cities soon followed the example of the Woman Suffrage Party by organizing on a local level so that every election district was covered. During this period, Carrie became very tired and sick. She had to reduce her suffrage work and spend more time resting. She eventually had an operation and began to feel somewhat better. In the meantime, the suffrage workers in the State of Washington arranged for an election on whether to give voting rights to women. The male voters approved woman suffrage by a large majority and Washington became the fifth state to grant equal voting rights to women. For the first time in many years, the woman suffrage movement in the U.S. had a victory to celebrate. The next convention of the International Woman Suffrage Alliance was planned for Stockholm, Sweden. Carrie’s health was still not very good, so her doctor was glad to learn that Carrie had decided to take a long tour around the world to rest and regain her strength. Of course, Carrie also planned to give speeches and work for suffrage wherever she went. Before the convention in Stockholm, Carrie made several speeches in Denmark and then traveled to Norway, where she met the Norwegian king. The Scandinavian countries were friendly to the cause of women’s rights and the convention in Stockholm was very successful. There were now branches from 24 countries that were members of the Alliance. Women were gaining rights in many of these countries. Carrie visited London after the convention and met with the English suffrage leaders. Then she set off for her trip around the world, accompanied by her Dutch friend and colleague, Dr. Aletta Jacobs. The great tour began with a passage by steamship down the west coast of Africa to Cape Town in South Africa. Carrie and Aletta spent three months in South Africa, traveling around the country and working for suffrage. As in the western United States, many of the women in South Africa lived as pioneers, working side-by-side with men. Some of the Dutch settlers, known as Boers, supported woman suffrage, but most of the English settlers were opposed. Carrie worked to bring together rival groups of suffragists, and with her help, the first national suffrage organization in South Africa was formed. Carrie and Aletta also spent time sight-seeing and met many of the notable people of South Africa, including Mohandas Gandhi, who was then a radical lawyer fighting for the rights of Asian workers in South Africa. Many years later Gandhi would become famous as the leader of India’s fight for independence from Britain. From South Africa, Carrie and Aletta traveled up the east coast of Africa by ship, stopping a number of times along the way. Then they toured Syria and Palestine, stopping in Jerusalem and Beirut. Everywhere they went, they met prominent women and urged them to work for equal rights. They visited Egypt, where Carrie organized a woman suffrage committee among Egyptian women. Many of the Egyptian women could not read and had been forbidden to take part in business or to do anything outside of the home. But times were beginning to change and the Egyptian women were interested in what Carrie had to say. After Egypt, their route went east along the southern edge of Asia, with stops in India and Burma on the way to the Dutch East Indies. Carrie and Aletta spent two months in the East Indies. Aletta had relatives there and made many speeches for women’s voting rights. Carrie helped organized suffrage clubs, but did not do much speaking because she did not know Dutch and few people there understood English. Carrie knew that progress for suffrage and women’s rights would be very slow in the East Indies, since most of the women there felt they simply had to do what men told them to do. After the East Indies, the two women traveled northward, stopping in Hong Kong and the Philippines before reaching China. Chinese women were an inspiration to Carrie. Except among the wealthy, women had the same kinds of jobs and businesses as men. Women were also becoming active politically in China. Carrie was thrilled to see a revolutionary assembly in Canton, China, with women participating as full members. After all, there were still no women in the United States Congress. Carrie was deeply impressed by the courage and ability of the Chinese women that she met. More than ever she understood that the American suffrage movement was part of a worldwide struggle to improve the position of women. There was much that American women could learn from women of other countries. Carrie and Aletta traveled through a large part of China. It was an exciting and frightening time, because China was in the midst of a civil war. Chinese women fought and died alongside men, but when the revolution succeeded, the men broke their promise and did not let women have equal rights. From China, Carrie and Aletta went on to Korea and Japan. One day during her visit to Japan, Carrie had two meetings. One was with Americans who were living in Japan. This was a social occasion with no importance for the work Carrie was doing. By the time the chit-chat with the Americans was over, Carrie felt completely worn out. Her other meeting that day was with a group of feminist Japanese women. Carrie wanted to convince them to join the International Alliance, but they were hesitant. Finally, after much discussion they agreed. Carrie felt wonderful when her meeting with the Japanese women was over, not tired at all! At the end of their time in Japan, Carrie said good-bye to Aletta, who returned to Europe as Carrie set out towards California with a stopover in Hawaii. We have made suffrage speeches to audiences on four continents: America, Europe, Africa, Asia, and on the ships of three oceans. Our audiences have included the followers of every main religion … and representatives of all the main human races … . We have left the seeds of revolution behind us, and the hope of liberty in many souls. But we have got much more than we gave … especially … the intensified conviction that the Cause of Woman cannot wait. I am tired and I would like to retire from the work and the worry, but … I must keep at it. Carrie arrived in San Francisco in November 1912. This was a special time, for the women of California had won the right to vote in 1911 and were now voting for the first time. Carrie got to see her old friends among the California suffragists voting and encouraging other women to vote. In six other states the male electorate was deciding whether to extend voting rights to women. Woman suffrage was defeated in Michigan, Ohio and Wisconsin, but there were victories in Arizona, Kansas and Oregon. Women now had the same voting rights as men in nine of the 48 states, including five states that had been added in the last five years. The hopes for more successes were greater than they had ever been. When Carrie came back to New York, the state Woman Suffrage Party welcomed her with a celebration at Carnegie Hall. She made a speech reporting on her two-year trip around the world. She told her audience that they shared “One Cause” with women everywhere, and now was the time to push harder than ever. To her friends, Carrie seemed more rested and relaxed than before her trip. She was easier to talk to and reached out to people more often. She was ready to make her greatest accomplishments as a leader. In 1913, the legislature of the state of Illinois granted the women of Illinois the right to vote in presidential elections. This was the first important victory for the suffrage movement east of the Mississippi. Carrie believed that the time had come for an all-out effort to win voting rights for women in New York State, which in those days was by far the most important state in the country. She decided to spend less time working with the International Alliance so that she could concentrate on organizing the suffragists in New York. Carrie and her co-workers arranged for a referendum on woman suffrage to be held in New York in November 1915. At that time the voters of New York, who of course were all men, would vote on the question of whether women in New York State should have voting rights. Carrie carefully planned a two-year campaign. Mary Garrett Hay organized New York City ward by ward, and Carrie traveled all around upstate New York making speeches and encouraging the local suffrage organizations. For a time the start of a great war in Europe distracted the country and the suffrage workers. Like many other people, Carrie was deeply surprised by the start of the First World War. She believed that war had become so terribly destructive that the political leaders would not let a war begin. She was wrong. The politicians of Europe did not understand how great would be the costs of the horrible war they had begun. The awful news of war was also, in a strange way, good news for Carrie. She knew that the International Alliance would have to shut down during the war and that she would be free to stay at home and lead the New York State campaign. The New York State Woman Suffrage Party set up a school for campaign workers. The state was divided into 12 large districts and a leader was appointed for each of the 150 State Assembly districts. The Assembly district leaders supervised some 5,500 local district captains. Every part of the state had someone who was responsible for organizing it. By 1915, the New York State Suffrage Association had more than a quarter of a million members, about evenly divided between New York City and the rest of the state. Outside of the city there were 2000 full-time suffrage workers and 200 speakers. Other good things were happening for the suffrage movement. Carrie persuaded two very important national organizations to declare their support for woman suffrage. These were the National Education Association, which was the main teachers’ organization, and the General Federation of Women’s Clubs, which was the largest organization of women in the country. It was getting harder and harder for opponents of woman suffrage to say that women did not want the vote! Mrs. Frank Leslie, a wealthy woman who had for a long time admired Carrie’s work, died and left her large fortune for Carrie to spend on the suffrage movement. Carrie was thrilled when she learned this news. Part of Mrs. Leslie’s estate included a collection of jewelry, diamonds, emeralds and rubies. Carrie and her friends in the office looked over and admired everything, then packed the jewels away to be sold. Although it would take several years to settle many claims and lawsuits against Mrs. Leslie’s estate, eventually Carrie received almost a million dollars that she was able to use in her suffrage work. Just before the election in November 1915, the New York suffrage campaign climaxed with a huge parade in New York City. Thirty thousand women and five thousand male supporters marched up Fifth Avenue. Some of the women in the parade were wealthy and socially prominent. Others were workers – teachers, sales clerks, stenographers and nurses. Women from all parts of the city were joining together to fight for their rights. On Election Day, the men of New York voted against the equal suffrage proposal. There were defeats at the same time in New Jersey, Pennsylvania and Massachusetts. But in all of those states except Massachusetts, the vote had been close. Carrie was encouraged, not disappointed. She started working immediately for another vote in New York to be held in two years. “Victory in 1917” was the slogan she announced to a large and enthusiastic meeting. One hundred thousand dollars was raised on the spot to get the new campaign going. She was confident that one more push would bring success in New York. In December 1915, Dr. Anna Howard Shaw announced that she was resigning as president of the National American Woman Suffrage Association. The Association turned to Carrie as the obvious choice to take over as president. Carrie was reluctant. She had just committed herself to lead the campaign in New York for the next two years. But there was no one else who was nearly as well qualified to lead the national organization. Carrie remembered the disappointment she had suffered back in 1900, when the board had blocked her plans for running the organization. She insisted that she would not become president unless she could select all the members of the board. This time there would be no doubts about who was in charge of the Association, and Carrie would be free to run it as she thought best. The members of the organization agreed to Carrie’s conditions. At the age of 55, Carrie again became president of NAWSA. She found it necessary to replace almost every member of the board. She wanted to be sure that the Association was ready for a final effort that would lead to victory. Hard work and unity would be the keys to success. Carrie immediately began to travel around the country, meeting with suffragists and getting reacquainted with the national organization. She also started planning a campaign that would try for an amendment to the U.S. Constitution, so that women would have equal voting rights in all of the states where they had not yet been successful. Carrie decided to put pressure on both the Republican and Democratic parties to declare support for woman suffrage. 1916 was a presidential election year, and the presidential nominating conventions would be good opportunities for the suffragists to make their point. During the Republican convention in Chicago, the suffragists staged a large parade in spite of terrible rain and wind. In Saint Louis, Missouri at the Democratic convention, suffragists in white dresses with yellow sashes lined the street from the delegates’ hotel to the convention hall. The delegates could not forget that the suffrage forces were demanding their support. Neither convention announced strong support for woman suffrage, but both were concerned enough about the growing strength of the suffrage movement that they felt they should at least give the appearance of being in favor. Shortly after the conventions Charles Evans Hughes, who was the Republican presidential candidate, announced that he personally supported a federal suffrage amendment. In September 1916, Carrie called NAWSA to Atlantic City, New Jersey for an emergency convention. She announced that the time had come for the Association to push for an amendment to the United States Constitution to give women equal voting rights throughout the country. The state-by-state campaigns had been making some progress, but it would take many years for all American women to get the right to vote, unless the suffrage movement changed its approach. If all of the local branches of the Association worked together, they could win a final victory in just a few years. It would be a difficult fight, because a constitutional amendment had to be approved by a two-thirds majority in both houses of the Congress, and then also approved by the legislatures of three-fourths of the states. Carrie presented a detailed plan for a campaign that would convince the Congress to vote for the amendment and then would move into the states to get the necessary votes from the state legislatures. She insisted that the state suffrage organizations would have to work harder than ever before, even in the states where women already had voting rights. There were then 48 states in the U.S., so that approval from 36 state legislatures would be needed. Carrie expected that most of the southern states would not support the amendment, and the suffragists would need to win approval from almost every state outside of the South. If the campaign failed in only one or two states outside of the South, the whole plan would probably fail. Some of the state suffrage organizations wanted to keep working within their states to change the state constitutions in order to win voting rights state-by-state. Carrie said that would be all right, but they also had to work for the federal amendment. Most of the state organizations agreed. The campaign for the federal amendment would need a lot of money. Carrie called for the state organizations to raise $1,000,000. The convention immediately pledged to raise most of the money, and it was clear that the rest of the money would be contributed soon. Carrie invited President Wilson to speak at the convention. He told the suffrage workers that he was on their side, but he did not definitely promise to work for the federal amendment. The suffragists knew that President Wilson, as the head of the Democratic Party, had to be careful not to offend southern Democrats. The southerners were a very important part of the Party and did not favor woman suffrage. In November 1916, President Wilson was re-elected. It was a close election. Many people believed that votes from women in the western states had helped Wilson to win. This increased support for woman suffrage in the Democratic Party. Early in 1917, it became clear that President Wilson’s administration and other powerful groups wanted the United States to start fighting on the side of England and France in the war against Germany. The war had been going on for two and a half years, and France and England had been suffering terrible losses. Possibly they wouldn’t lose the war, but they didn’t seem to have much chance of winning without help from the United States. Carrie was faced with a most difficult problem as the government and other groups started a publicity campaign to convince the American people to enter the war. Carrie personally hated war. She had helped to start the Women’s Peace Party, which had worked to try to stop the war and to keep the United States out of it. Many members of NAWSA were against the U.S. getting involved, but a large number supported the idea of the U.S. joining the fighting. Carrie did not wish to offend either group. Most of all, she did not want the suffrage movement to lose public support by opposing the campaign for the U.S. to join France and England. She could see that the U.S. was certain to enter the war, and that NAWSA could not change things by resisting, but would only be hurt if it tried to resist. Carrie reluctantly led the Association to announce that it would support the war effort. This was a big help to President Wilson, and made him even more indebted to the suffragists. The Women’s Peace Party asked Carrie to resign and she did. Some of her old friends were disappointed that Carrie was going along with the war, but Carrie felt she was doing what she had to in order to protect the suffrage movement. Carrie made other compromises that she felt were necessary for her cause to succeed. Although she was not biased herself, she did not want to offend Southern white leaders, so she mainly kept African-American women from being active in the suffrage movement. Carrie’s message to Southern whites was that they would still be able to keep African-Americans from voting after they gave voting rights to white women. Many suffrage workers took part in the huge effort to support the troops that were being sent to Europe. Carrie made a few speeches about helping the war effort, but mainly she kept on working for suffrage. She did not want her supporters to get so involved in war work that they dropped out of the suffrage movement. She felt that this was the time when a final victory could be won. The war gave suffragists new arguments for their cause. The purpose of the war effort was to preserve democracy, but how could the U.S. be a true democracy if almost half the adult citizens were not allowed to vote? Now that the government was calling for all Americans, both men and women, to do their part, shouldn’t both women and men have equal voices in the government? Women were also becoming more and more important in the economy of the United States. Even before the war, women had worked in many clothing factories, retail stores and offices. As men joined the army and factories expanded to help the war effort, women took over jobs making metal parts, explosives, guns and chemicals. They did work that previously had been done only by men. The build-up for war could not have succeeded without women workers. Carrie kept up her quiet cooperation with President Wilson. When the Woman’s Party, led by Alice Paul, picketed the White House as part of their militant campaign for suffrage, Carrie heard about the plans ahead of time from her friends in the Woman’s Party and warned the President so that he could protect himself from embarrassment. Carrie had been careful to keep NAWSA separate from the militant tactics of the Woman’s Party. She believed that militant tactics would not work well in the United States. But when militant suffragists of the Woman’s Party demonstrated in the streets and were arrested for blocking traffic, the publicity kept people thinking about the suffrage movement. The activities of the radicals of the Woman’s Party made Carrie Catt and NAWSA seem quite conservative and respectable. NAWSA was a group that many women found they could be comfortable joining and many politicians were willing to work with. After the final victory was won, it was clear that the radicals and the NAWSA had both played important parts in the success of the movement. For most Americans the most important event of 1917 was the entrance of the U.S. into the European war. But for Carrie the crucial battle was the second suffrage campaign in New York State. Carrie concentrated on her work with the New York Woman Suffrage Party and getting the federal amendment campaign started, while also doing what she could to keep her supporters from being distracted by the war. The 1917 New York campaign was even better organized than the 1915 campaign. Because of the war it didn’t seem right to stage many large public events. The suffrage workers concentrated on going door-to-door, trying to convince every household to join their cause. They collected more than a million women’s signatures on a petition asking the male voters for the right to vote. Carrie led a big parade up Fifth Avenue in New York City just before the election. The marchers carried so many banners with arguments for woman suffrage that is was like watching a speech walk by. The result of the election was a great victory, more important than any before in the history of the cause. The suffrage issue had been carried in New York City by more than 100,000 votes, easily enough to overcome a small deficit among the voters outside of the city. It was a triumph for Carrie’s organization that so many of the voters in conservative upstate New York had been persuaded to support women’s voting rights. But the large margin of victory in New York City was the key. This was a personal victory for Carrie’s old friend and chief helper Mary Garrett Hay. Mary Hay had made the New York City suffrage organization so strong and effective that Tammany Hall, the notorious Democratic Party “machine”, decided it would be best not to try to defeat the suffragists with phony ballots, intentional miscounting of votes, or any of Tammany’s other ways of stealing elections. This left the way clear for the overwhelming success by the suffragists in the city. Fresh from the victory in New York, Carrie went to Washington, D.C. in December 1917 to lead the NAWSA convention. She also met with members of Congress, for she felt that 1918 would be the year in which the federal suffrage amendment could be pushed through Congress. The state suffrage organizations were letting their elected representatives know that this was the time to stand up for women’s voting rights. Early in January 1918, the House of Representatives passed the suffrage amendment, with just barely more than the required two-thirds vote. Women won national voting rights in England on the same thrilling day. Now it was up to the U.S. Senate. Carrie urged the state suffrage organizations to pressure their senators to consider the amendment and to pass it. She also bought a new dress to wear while campaigning around the country for state approval of the amendment after the Senate had acted. But the Senate did not act. Opponents, mainly from the conservative South, did not let the amendment come to the floor for a vote. Carrie visited personally with President Wilson, asking him to persuade the Senate to approve the amendment. He wrote a letter to the senators but they paid no attention. The delays continued. Carrie felt terribly frustrated. Her grand plan for a final victory was being held up by a small group of stubborn old men. In late September, the President made a personal visit to the Senate floor and spoke out in favor of the amendment. The next day, the Senate voted, but the amendment lost by two votes. The opponents in the Senate had delayed almost until the elections in November, but they had not delayed long enough. Under Carrie’s direction, NAWSA made an exception from its usual policy of not working for or against particular candidates. The Association picked four Senate opponents that it would actively work against to prevent their re-election in November. In spite of the short amount of time available for campaigning, the suffrage forces were successful in defeating two of the four targeted senators. This was also the first election in which the women of New York were allowed to vote. Although she was very ill with influenza, Carrie got up and went to the polls with her dear friend Mary Garrett Hay. A group of reporters was there to greet them, as Carrie voted for the first time in her life, at the age of 59. The war in Europe came to an end a few days later. No longer did Carrie have to support a war effort that she did not really believe in. Immediately, she began working to try to prevent any future war from occurring. This would be her next great crusade, one that would continue long after her suffrage work in the U.S. had been successfully completed. In March 1919, NAWSA held its annual convention in St. Louis, Missouri. The delegates celebrated the fiftieth anniversary of the National and American Woman Suffrage Associations. They also marked the fiftieth year since women had been granted voting rights in Wyoming, the first state to enfranchise women. The convention prepared for the state-by-state campaign that would follow the expected Congressional passage of the federal suffrage amendment. With the final victory in sight, Carrie felt the time was right to start a new organization, to be called the League of Women Voters. When the federal amendment was ratified, the number of women with voting rights in the U.S. would be increased from seven million to about 27 million. Carrie saw a need to bring the 20 million new women voters into the political system. She planned to educate them about how the system worked and what they could do with their new political power. She wanted women to be thoughtful and informed citizens who would change politics and improve their country. The new organization would help to achieve these goals. NAWSA had more than two million members and Carrie hoped that many of them would continue to be active in the League after NAWSA had achieved its purpose and ended its activities. In May, the new Congress convened in Washington. Within two days the House of Representatives had passed the suffrage amendment. In the Senate, the weakened opponents could delay for only a few weeks. This time the amendment passed with 56 votes to 25. The long campaign for women’s voting rights in the U.S. entered its final stage. The suffrage amendment would become law if approved by the legislatures of 36 of the 48 states. The suffrage forces immediately went to work in the states. By delaying the amendment until 1919, the opponents in the Senate had given the suffragists an additional problem. Most state legislatures were not in session that year, so the suffrage forces would have to arrange for special sessions to be called. The governors of some states were suffrage supporters and called special sessions promptly. Three state legislatures ratified the amendment within one week after passage by the Senate. Six more ratifications came in within the next three weeks. As of the end of September, seventeen states had ratified, but in three states where the opponents were strong, they had brought the amendment up to the legislature in order to defeat it. By the fall of 1919, the strong suffrage states had approved the amendment, but more approvals were needed, and the victories would not come easily. Many governors were still refusing to call special sessions. The suffragists had to apply pressure and rally their supporters to keep the amendment moving. Carrie spent two months on a tour of thirteen states, speaking at meetings in support of ratification. During November and December, five more states ratified the amendment, and by the middle of February 1920, thirty-one of the needed thirty-six state approvals had been won. The opponents were not giving up. They tried to have elections by the voters to overturn the state legislatures’ ratifications. However, the United States Supreme Court ruled that the U.S. Constitution did not permit elections to take back ratifications. By the spring of 1920, thirty-five states had ratified, and only one more was needed to bring the amendment into effect. By now it was clear that most of the remaining states would not ratify. The opponents were able to concentrate their forces on trying to block the amendment in the states that suffragists might still win. For several months there were no more victories. The governors of Connecticut and Vermont refused to call special sessions. In Virginia, the legislature voted against ratification. One house of the Delaware legislature would not even bring the amendment up for a vote. After a personal request from President Wilson, the governor of Tennessee called the state legislature into special session to consider the suffrage amendment. Carrie and her supporters, and the opposing forces from all over the country, gathered for a final showdown in Nashville, Tennessee in the stifling heat of August. Representatives from both sides constantly spoke to the Tennessee legislators. Carrie believed the opponents were resorting to bribery and other tricks. Everyone knew that the vote would be close, but it was impossible to say which way it would go. Finally the vote came. The youngest legislator, Harry Burn, was just twenty-four years old. He was from a district that opposed the amendment, but his mother had written a letter to him. She had told him it was his duty to help Mrs. Catt and the suffragists. Burn’s vote made the difference as the amendment was approved by 49 to 47. The battle that had started more than seventy years before was over. More than 130 years after the establishment of the Constitution, and 55 years after the Civil War, all women in the United States at last had the right to vote. Carrie returned to New York from Tennessee. On the way she stopped in Washington, where President Wilson met with her and her supporters to congratulate them on their victory. When she arrived in New York there was a big public celebration. Governor Alfred E. Smith and other leading citizens greeted her. She received a bouquet, tied in the yellow ribbon that was the symbol of the suffrage movement. A famous picture of Carrie shows the happiness and relief that was hers. She had led her army of suffragists to win a great reform of the political system. They had opened for all time one of the doors that had been closed to women, while strengthening the ideal of democratic government. A few months later, the 1920 presidential election was held. Thirty million Americans voted in the election--an enormous increase over the eighteen million votes cast in 1916. The year 1920 marked the greatest peaceful expansion of voting rights that the world had ever seen. The fight for women’s voting rights in the U.S. was over, but Carrie’s life as a political figure was not. She would continue to work in the international suffrage movement, she would help to guide the early years of the League of Women Voters, but most of all she would devote herself to the cause of world peace. Carrie chose Maud Wood Park to be the first president of the League of Women Voters. Maud had worked closely with Carrie and had played an important role in getting the suffrage amendment through Congress. Under the leadership of Maud Wood Park and later presidents, the League became an important voice for good government. From the 1920s up to the present time, voters have relied on the League for valuable information about political issues. At the League of Women Voters convention in 1921, Carrie made a powerful speech in which she poured out the pain and anger she had felt about the millions of deaths caused by the World War. The audience wept silently during her speech, and then rose at the end to applaud and cheer for Carrie’s call to action. Carrie worked for suffrage in Europe and South America for the next few years, but in 1923 she resigned as president of the International Woman Suffrage Alliance, having served in that position for 21 years. Now she was free to put all her efforts into the peace movement. She began by traveling around the United States making speeches about outlawing war. Some people accused Carrie of being disloyal to her country, but she fought back strongly with articles and more speeches to point out the mistakes of the people who attacked her. Carrie organized a series of conferences on “the Cause and Cure of War.” Carrie wanted the conferences to reach out to conservative groups and to women who did not yet have strong opinions on the subject of peace and war. Some of the speakers were military experts and prominent public officials. At the second conference, held in 1926, one of the speakers said there might be a war between the United States and Mexico because of a dispute between American oil companies and the Mexican government. Thanks to the work of Carrie and other people in the peace movement, the United States government started discussing the problem with the Mexican government. Eventually the two countries reached an agreement and war was avoided. In 1928, the third conference in the series was held. Carrie warned that many people were talking and thinking about “the next war”. She supported a proposed treaty in which the strongest countries would agree that there would be no more wars. The treaty was adopted in 1928, but there was nothing in the treaty that would have any practical effect on countries that broke the treaty. The treaty was a failure. Under Carrie’s direction, the Committee on the Cause and Cure of War became one of the best known of the organizations that were working for peace. In 1930, the Committee collected 12 million signatures on a petition supporting a proposed Naval Disarmament treaty. The treaty was adopted, but the major countries almost immediately started ignoring the treaty by building more warships. In the 1930s there was a great economic depression around the world. A large number of banks and other companies went out of business. Many people became angry and disappointed because they had no jobs and no money. Some of them believed other countries were taking away their jobs. Many countries were building up their armies and navies. People feared that there would be another war. Carrie and her committee supported the idea of a World Court, which they hoped would settle disputes between countries without war in the same way that courts in civilized countries settle disputes between citizens. Carrie joined with Elihu Root, an old suffrage opponent, in lobbying the U.S. Senate to approve membership in the World Court. The Senate did not listen. The World Court was crippled by the refusal of the U.S. to participate. Even when Carrie was in her late seventies, she was still a vigorous and effective speaker. She stayed active in the “Committee on the Cause and Cure of War” and continued to argue for peace even after all hope had gone. The committee held the last conference in 1940, after the Second World War had already started. During the war, Carrie wrote letters warning about the terrible things that were being done to Jewish people in Europe and she tried to help war refugees. As the war was ending, Carrie, like her friend Eleanor Roosevelt, supported the creation of the United Nations. Carrie Chapman Catt died at her home in New Rochelle, New York in 1947. She was 88 years old. The great cause of peace to which she had devoted the last part of her life was more successful after her death than during her lifetime. The two terrible wars of the first half of the twentieth century were not repeated during the second half. Although there are still small wars, and adults and children suffer and die in some of the poorer countries of the world, it has become almost certain that none of the advanced and powerful countries will ever again go to war against each other. In that sense, Carrie and the others who worked and struggled for peace have accomplished part of their goal. The League of Women Voters, which Carrie founded to continue working for reform after the suffrage battle had been won, is over 85 years old. The League helps and encourages people to be active, informed and intelligent citizens. It sponsors debates among political candidates and presents educational programs on many subjects. Open now to men as well as women, the League carefully studies important issues, decides what it thinks should be done, and works to improve conditions on the local, state, national and international levels. Almost every country now recognizes the right of women to vote. The International Woman Suffrage Alliance, which Carrie helped to start and served as president for twenty years, is now known as the International Alliance of Women. Together with member organizations in many countries, the IAW is still helping women to advance toward true equality in government, business and education. When the day comes that a woman is sworn in as President of the United States, when half of the Senators and Representatives, half of the governors and mayors, half of the state legislators are women, Carrie Chapman Catt and the other suffrage leaders will be remembered for all they did to bring the United States and the world closer to true democracy. a good resource about women in politics in the U.S.
one resource from the website of Sonia Pressman Fuentes, one of the leaders of feminism's "second wave"
a concise history of the "waves" of women's activism in the U.S. In terms of "bringing back" Carrie from her undeserved obscurity, it has long been a dream of mine that there be a feature film "bio-pic" about her. It could be done as a sort of remake of the movie "Patton" but with vintage cars and banners instead of tanks and guns. It could focus on the crucial period 1915 to 1920, beginning with the loss of the NY suffrage referendum in 1915 (turned into glorious victory 2 years later) and ending with the ultimate triumph of the suffragists in August 1920. Just like "Patton", the film could open with Catt giving a rousing speech, such as her emotion-filled anti-war remarks at the League of Women Voters convention in 1921. Any film producers out there? The lead could probably win an Oscar for portraying CCC.